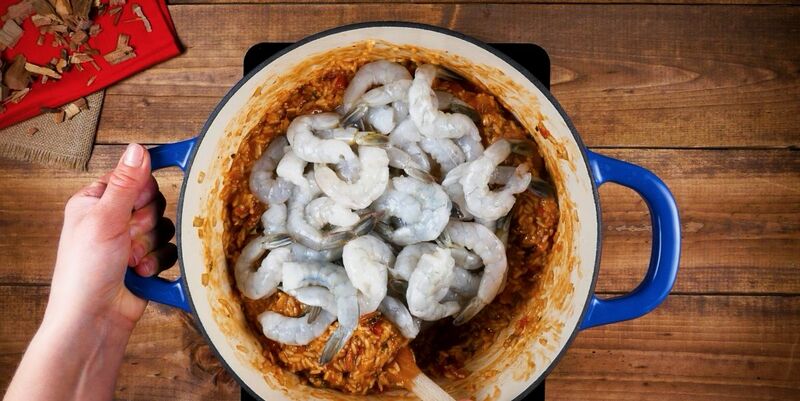 Despite what many recipes would have you believe, a true jambalaya doesn't actually contain that much tomato. It gets its rich color from slowly cooking the sausage and the Holy Trinity – a combination of onion, bell pepper and garlic. 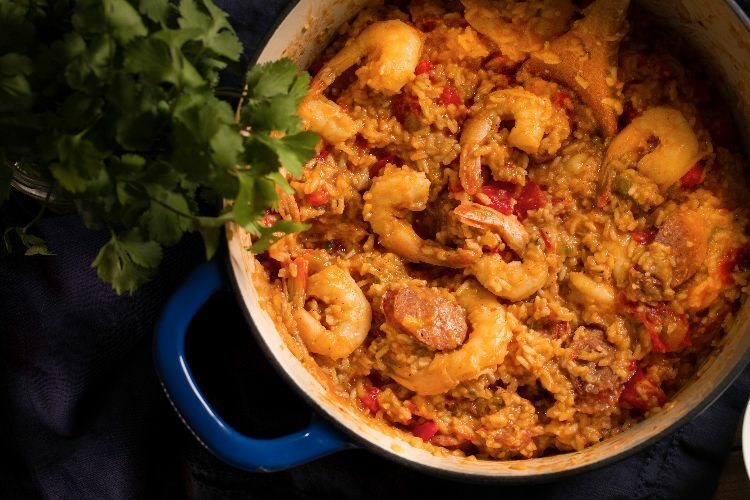 This recipe features Louisiana-style smoked sausage as well as shrimp. Add the shrimp at the last minute to make sure they don't overcook. The dish is made even better when served with a garnish of green onion and a dash of hot sauce, added at the table. Heat the vegetable oil in a heavy-bottomed pot, such as a Dutch oven. Add the sausage, onion and green bell pepper, and season with salt and pepper. Cook for about 10 minutes, or until a rich fond begins to develop on the bottom of the pan. Add 1/2 cup of chicken broth and stir, scraping up the fond. Do this step two more times. When the third 1/2 cup of chicken broth has cooked off, add the garlic and cook until fragrant, about 1 minute. Add the rice, tomatoes, thyme, cayenne pepper and remaining chicken broth. Stir to combine. Bring to a boil, reduce the heat and put the cover on the pan. Cook for about 20 minutes, or until the rice is cooked through. Remove the cover and taste the rice; season with salt and pepper as needed. Add the shrimp and stir in. Cook for 2 to 3 minutes, until the shrimp are pink and cooked through.